Debbie--have you seen Ruby Slipperjack's THE RESIDENTIAL SCHOOL DIARY OF VIOLET PESHEENS? A reader wrote to ask if I've seen Ruby Slipperjack's The Residential School Diary of Violet Pesheens. Published by Scholastic in its Dear Canada series, this one is set in Northern Ontario, Canada, 1966. Violet Pesheens is struggling to adjust to her new life at Residential School. She misses her Grandma; she has run-ins with Cree girls; at her “white” school, everyone just stares; and everything she brought has been taken from her, including her name—she is now just a number. But worst of all, she has a fear. A fear of forgetting the things she treasures most: her Anishnabe language; the names of those she knew before; and her traditional customs. A fear of forgetting who she was. Drawing from her own experiences at Residential School, Ruby Slipperjack creates a brave, yet heartbreaking heroine in Violet, and lets young readers glimpse into an all-too important chapter in our nation’s history. I hope I am able to get a copy! Because this is an #OwnVoices book, I look forward to it. After Gabi's parents' divorce, she moves from California to Alaska with her dad. At first, it feels like banishment--until she meets Kai. He welcomes her into his life, sharing his family, his friends, and his warmth. But as winter approaches, Kai pulls away for seemingly no reason at all. He's quiet, withdrawn. Then one day, he disappears. Kai's twin brother, Hunter, believes Kai is retracing their missing father's steps in the wilderness north of Anchorage. There's a blizzard on the way, and Kai is alone out there. Gabi's frustration over his emotional distance quickly turns to serious concern. This is the boy who saved her from the dark. She can't lose him to it. So Gabi and Hunter agree to head out together on a wild journey north--a trip that will challenge them physically and emotionally, as they try to convince the boy they love to return home. An Alaska Native reader who is Tlingit wrote to me to share concerns with the book. As regular readers of AICL may recall, I get email from people who prefer not to be identified. Some worry about backlash on them or their children. I respect their requests and am grateful for their careful readings of children's and young adult books. The two brothers in Whenever I'm With You are identified as having a Tlingit father and a Canadian mother, but no further information is provided. Are they enrolled? What part of Alaska is their father from? Were the two brothers raised outside their Tlingit community, and therefore, don't know enough about it to say more than they do? The idea of them being Tlingit is so lacking in detail to support it, that they could be Haida or a different Alaska Native tribe. Because there is so little there, they could even be white and it would make no difference in the story. An example of them sounding white is in the way they speak about hunting. It doesn't sound the way Native Alaskans talk about hunting. "What is that?" I ask. He swallows. "Something you should try." It must be made of dog lips or something. "Don't avoid the question." "All right, I'll tell you what this is, but only after you take a bite. Are you willing to trust me that it won't kill you? That you might even like it?" "What doesn't kill us makes us stronger, right?" At least, that's what Kelly Clarkson says. And if Hunter can eat it without gagging, it can't be that bad. I scoop out a spoonful and force it into my mouth. It's sweet. The chunky part is definitely some kind of berry. And the rest of it has a consistency similar to... "Mousse? I mean the dessert kind." Headshake. "It's called akutaq. Do you like it?" "I wouldn't say like. But I wouldn't say hate, either." I take one more bite and push the rest of it away. That's more than enough sugar for me. "Okay, I tried it. Now, what's in it?" He can't be serious. "Like, animal fat?" "And berries," he repeats, smiling, clearly enjoying my display of culture shock. "The berries are only there to make it taste good. Because it's fat." How is this a real thing people pay to eat? How does he not understand this is gross? "It's flavored. Fat." "And it's good." He scrapes the last of his out of the dish. "Even you said it wasn't bad." Hunter's laugh comes out in spurts, like he's trying to hold it in and concentrate on more important bodily functions, like chewing and swallowing and not spewing his akutaq all over the table. Although it probably wouldn't look much different in vomit form. The Tlingit reader who wrote to me is offended by the comparison of akutaq to vomit and imagines other Alaska Native readers would be offended by it, too. The reader wonders if--by way of passages like that--readers are supposed to dislike Gabi and her negative impressions of Alaska Native land, people, and culture. 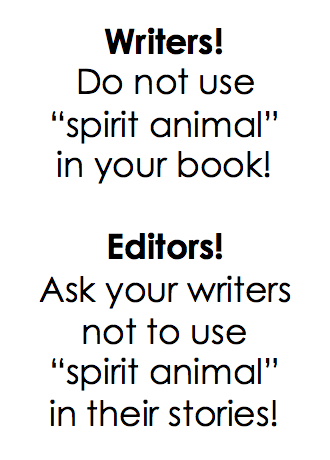 The reader further says that these passages mark the book as one NOT meant for Alaska Native readers. Another example of the author not considering an Alaska Native reader is where Alaskan lands are described as a giant expanse of nothing. Maybe it's my imagination, but I think the bear is looking right at me. Right into me. My heart thumps hard in my chest, my head, my ears, my throat; I feel it everywhere. But this thing I'm feeling isn't "scared." I don't know what it is. Exposed, maybe. Vulnerable. Or... trust? I'm putting my absolute trust in this creature not to charge and attack me. That has to be it--trust in its purest form--and the realization calms me. Tension falls away like I'm shedding a heavy coat. For the first time ever I let go of my control of a situation without feeling out of control. Total serenity. From a bear. It lazily turns its head back to the river, and soon we're riding off, every second giving us more and more distance from a possible threat. The moment is gone, but the impact of it stays with me all the way to Jack Randy's house. Even if I had been paying attention to how we got here instead of contemplating whether the brown bear is my spirit animal, I couldn't find this place again if I had to. 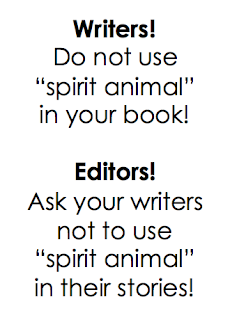 Who, I wonder, was the editor at Scholastic?! There are times when I think Scholastic is just a bit ahead of the field in terms of offering readers books with better representations of Native peoples, and then, they publish books like this one. I am only sixteen years old as I trek across the country with my infant son strapped to my back. I have a river, two lakes, and four mountain peaks named after me. I am featured on the U.S golden dollar. I am Sacagawea. Initially, this post was going to be in AICL's "Debbie--have you seen" series. I decided to get and read it right away. I do not recommend I Am Sacagawea for several reasons. First, it is written in first person. The author has to imagine a lot about a person who lived in a different time. Writing in first person means the author is speaking as that person. Without a body of writing from that person, I think it is highly problematic to speak in that person's voice. Especially when that person is someone who is not of ones own people or nation. I don't think Grace Norwich is Native. Author identity isn't a hard and fast rule for me. She could write a book about Native people that might be terrific, and I'd recommend it, but I prefer to recommend books by Native people who are writing from their own nations experience and history. Second, it reads like an outsider wrote it. Pioneers faces harsh weather, lack of food, and wild animals. But life was especially hard for me. Born an Indian girl, I didn't have many rights or much freedom. No one imagined that I was destined for more than cooking, cleaning, gathering food, raising children, and obeying my husband. What Norwich gives readers with those passages is a stereotype. Europeans wrote about the "squaw" who was a drudge, laboring in the fields, no power. Lucky for Sacagawea, Norwich wants us to learn, it is the Lewis and Clark expedition that will raise her up and out of that life. That is definitely a sure sign of an outsider's voice, misrepresenting Native life, history, culture, and nationhood. Norwich leads readers to think that Sacagawea's nation and Native people overall, are a bad thing, while white men, in particular, of the U.S., are a good thing. Third, it is a classic white savior story. Not only do Lewis and Clark rescue her from that wretched life, one of them--Clark--saves her life. 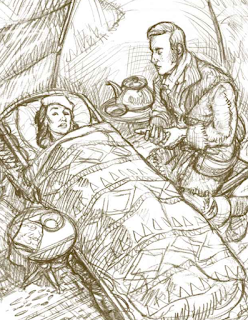 Sacagawea nearly dies of a fever, but Clark nurses her back to health. Sacagawea was likely suffering from an infection as her fever rose higher and higher. Clark, who saw how much she was suffering, took care of her. He sat with Sacagawea through the night, applying bark poultices (soft materials applied to the body to relieve soreness or inflammation). Did Clark sit with her like that, as the accompanying illustration shows? Let's look at the journals from the expedition. Note: I'm cutting/pasting from the online journals. Their formatting came along with the cut/paste. For ease of reading, I changed the font and size. Sah cah gah our Indian woman verry Sick & was bled. our Intrepters wife verry Sick. the Indian woman Verry sick I gave her a doste of Salts. the Indian woman verry Sick. Ordway and Whitehouse write in their entries that the Intrepters wife verry Sick. our Indian woman Sick & low Spirited I gave her the bark & apply it exteranaly to her region which revived her much. about 2 P. M. I reached the camp found the Indian woman extreemly ill and much reduced by her indisposition. this gave me some concern as well for the poor object herself, then with a young child in her arms, as from the consideration of her being our only dependence for a friendly negociation with the Snake Indians on whom we depend for horses to assist us in our portage from the Missouri to the columbia River. I found that two dozes of barks and opium which I had given her since my arrival had produced an alteration in her pulse for the better; they were now much fuller and more regular. I caused her to drink the mineral water altogether. wen I first came down I found that her pulse were scarcely perceptible, very quick frequently irregular and attended with strong nervous symptoms, that of the twitching of the fingers and leaders of the arm; now the pulse had become regular much fuller and a gentle perspiration had taken place; the nervous symptoms have also in a great measure abated, and she feels herself much freeer from pain. she complains principally of the lower region of the abdomen, I therefore continued the cataplasms of barks and laudnumn  which had been previously used by my friend Capt Clark. I beleive her disorder originated principally from an obstruction of the mensis in consequence of taking could. The Indian woman much better today, I have still continued the same course of medecine; she is free from pain clear of fever, her pulse regular, and eats as heartily as I am willing to permit her of broiled buffaloe well seasoned with pepper and salt and rich soope of the same meat; I think therefore that there is every rational hope of her recovery. The Indian woman is recovering fast she set up the greater part of the day and walked out for the fist time since she arrived here; she eats hartily and is free from fever or pain. I continue same course of medecine and regimen except that I added one doze of 15 drops of the oil of vitriol today about noon. our Intrepters wife Some what better than She has been for Some time past. the Indian woman was much better this morning she walked out and gathered a considerable quantity of the white apples of which she eat so heartily in their raw state, together with a considerable quantity of dryed fish without my knowledge that she complained very much and her fever again returned. I rebuked Sharbono severely for suffering her to indulge herself with such food he being privy to it and having been previously told what she must only eat. I now gave her broken dozes of diluted nitre untill it produced perspiration and at 10 P. M. 30 drops of laudnum which gave her a tolerable nights rest. our Intrepters wife Some better. The Indian woman is qute free from pain and fever this morning and appears to be in a fair way for recovery, she has been walking about and fishing. Do the dated entries above and my cut/paste of relevant content seem burdensome? My point in reading through all those entries and pasting relevant content here is to be thorough. Having read all that material, I don't think we can say that Clark had any feelings of warmth towards her... the kinds of warmth that "nursed" invoke. I don't see evidence that he sat with her through a night, either. Nonetheless, Norwich's presentation of that illness guides readers to think of Clark as a kind person who saved her life. That is the classic "white savior" that we see all too often in children's and young adult books. Though no one can really be sure about Sacagawea’s death, everyone can agree that she was a true American hero because she pushed herself beyond the definition others gave her. I see a lot of writers claim or describe Native people as "American" or First Americans. 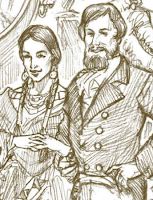 It'd be great if we could ask Sacagawea, directly, how she would describe herself. I know that a lot of Native women, today, identify first as citizens of our own tribal nation, and, citizens of the US, second. Teachers... if you have this book in your classroom, perhaps you can use it as a tool to teach critical literacy. Because the Lewis and Clark journals are online, you have easy access to them. Maybe you can take the book apart and give each child or pair of children a page from it and ask them to do some analysis, comparing what they read in the book to what is in the journals. There's a lot more I could write about, within the pages of Norwich's I Am Sacagawea. I won't though. 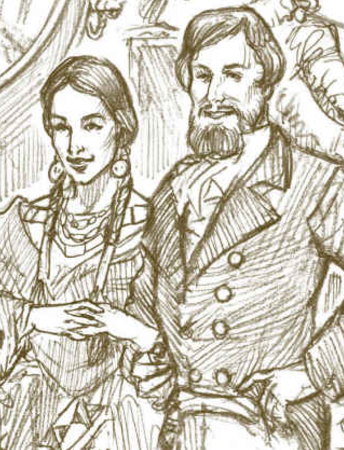 What I provide, coupled with this image from the book, are sufficient to tag I Am Sacagawea as not recommended. 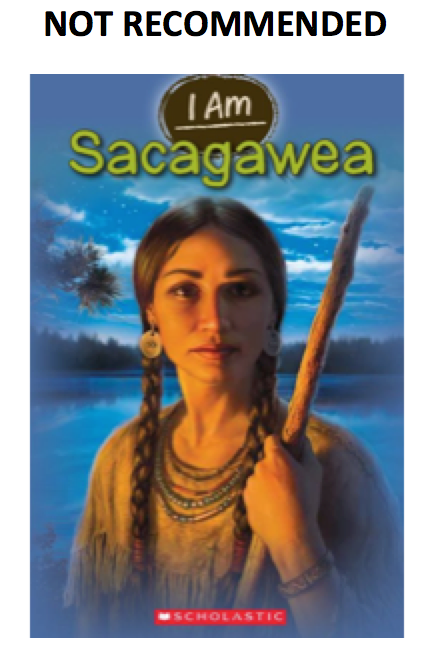 Published in 2012 by Scholastic, Grace Norwich's I Am Sacagawea is not recommended.